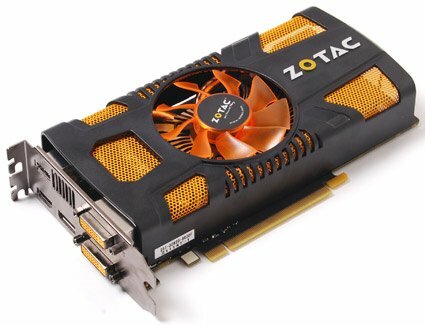 Zotac announced the GeForce GTX 560 Multiview, a new card with triple-display capabilities. It's equipped with dual dual-link DVI, DisplayPort and dual HDMI. ZOTAC® International, a leading innovator and the world’s largest channel manufacturer of graphics cards, motherboards and mini-PCs, today kicks off Computex 2011 with the ZOTAC® GeForce® GTX 560 Multiview – the world’s first native triple-display capable GeForce® GTX 560 series graphics card. The new ZOTAC® GeForce® 560 Multiview graphics card enables up to three matching 1080p displays to combine for a seamless multi-monitor computing experience. Dual-link DVI and DisplayPort outputs deliver resolutions up to 2560x1600 to one display while a pair of HDMI outputs can drive two displays with resolutions up to 1920x1080 for a total of three monitors driven by the single ZOTAC® GeForce® GTX 560 Multiview.